The apparent target of this huge assault is the town of Kurmuk—on the border with Ethiopia—which is the primary stronghold of the Sudan People’s Liberation Army/Movement-North (SPLA/M-N) in Blue Nile. These are the northern military units and political cadres of the broader movement known during the civil war (1983-2005) simply as the Sudan People’s Liberation Army/Movement; their homes and base of support, however, lie not within the newly formed South Sudan, but in the northern parts of the country still ruled by Khartoum. Following South Sudan’s declaration of independence, the increasingly militant Khartoum regime has felt obliged to respond with force to what threatens to become a “new South,” a source of resistance to the regime’s 22-year stranglehold on national wealth and power. 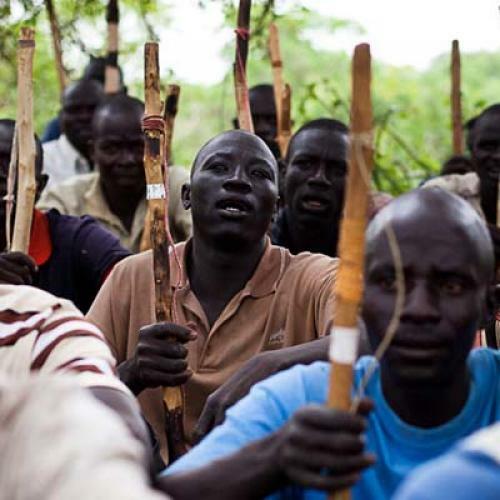 Focusing first on the nearby states of Abyei and South Kordofan, Khartoum has now turned its destructive attention to the rebel strongholds in Blue Nile. In the absence of increased international pressure on the regime, a bloody and protracted military confrontation appears imminent. [M]ore than 200,000 people affected by the fighting in South Kordofan faced “potentially catastrophic levels of malnutrition and mortality” because of Khartoum denying access to aid agencies. Also this week, two leading human rights groups said that deadly air raids on civilians in rebel-held areas of the Nuba Mountains may amount to war crimes. Like the military seizure of Abyei (May 20) and the assault on the Nuba and SPLA/M-N in South Kordofan (June 5), the current campaign in Blue Nile was well prepared for, with troops and armor poised to move quickly and decisively. The regime’s regular and militia forces moved preemptively, launching an attack on September 1 by bombing the home of the elected governor of Blue Nile, Malik Agar; Malik is also the political head of the SPLA/M-N. And as in South Kordofan, human displacement in Blue Nile has quickly become massive and suffering by civilians acute. More than 50,000 have been displaced since the beginning of Khartoum’s campaign on September 1, and25,000 have fled to Ethiopia. Khartoum is denying all humanitarian access, both to prevent foreign observers and as a savage weapon of war. Even so, resistance by the SPLA-N has proven stiff. Khartoum controls Damazin, the capital of Blue Nile, and Rosaries to the north—but almost nothing else in the state beyond the vast corridor of men and armaments moving southeast to Kurmuk. The movement of Khartoum’s troops has already been halted once in fierce fighting, but many thousands of civilians in Kurmuk are deeply at risk. This is in large part because Khartoum has increasingly resorted to “stand-off” military tactics, using artillery, tanks, and aircraft to do the fighting that regular troops are increasingly resisting. Such tactics are inherently indiscriminate, and civilians, not soldiers, are more often the victims. [A] well-informed source close to the National Congress Party reports that Sudan’s two most powerful generals went to [Sudanese President Omar Al] Bashir on May 5, five days after 11 soldiers were killed in an SPLA ambush in Abyei, on South Kordofan’s southwestern border, and demanded powers to act as they sought fit, without reference to the political leadership.